a heart surrendered: Not easy - but worth it! My friend Jill and I started our summer reading series. We read three chapters each week and then exchange our thoughts/convictions/responses with each other. It is always such a treat to be invited into the mind of someone as they dissect the truths of Scripture! And - incredibly encouraging! Below are some of the quotes that really popped out in the first chapters. I hope they will inspire someone else as much as they inspired and challenged me. And truthfully - this applies to every area of life. Now that we have been married for over two decades, I can wholeheartedly agree with this statement. Not so sure I could have done so, or even really understood it in the early years. Maturity and life experience definitely help us gain a proper perspective on relationships when we view them through the lens of Scripture. Every relationship falls under this truth. 'Self’ must disappear since we are called to die to it daily. AMEN - AMEN - AMEN! Marriage can become an idol. Whether doing everything to please our spouse and neglecting Christ or seeking to have all of our needs met through our spouse rather than being satisfied in Christ, marriage can easily take over the throne of our heart. “As long as a couple is married, they continue to display - however imperfectly - the ongoing commitment between Christ and his church. 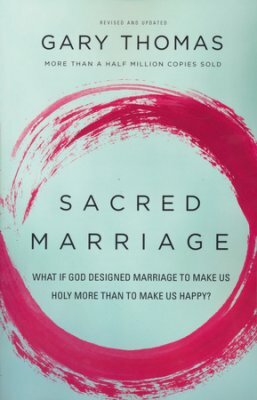 In a God-centered view, we preserve our marriage because it brings glory to God and points a sinful world to a reconciling Creator. Marriage is not just about us! It strengthens us, matures us, and refines us, but like everything else in life, the main purpose is to bring glory to God. If I think about my daily life with Dennis as a way to glorify the Lord, I will do everything better - with more joy - because I am doing it all for HIM. Like any other godly character quality, respect for others does not just “happen.” We must be intentional, seeking to love, honor, and respect our spouse on a daily basis - through the Lord’s strength - because it will not happen on its own. How could it? Our flesh wants to satisfy ‘self’ - not die to it! How I wish someone had taught me and Dennis what marriage really means when we were immature, foolish, and engaged young adults. We did not have godly, older, wiser, or mature couples investing in us or sharing their own trials and triumphs with us to help prepare us for what was to come, and we suffered because of it. But God’s grace has kept us together day after day, year after year, and we know without a doubt that our 23 years of marriage has nothing to do with us, but has everything to do with the redemptive work of a Savior who cares about our holiness far more than our happiness. Thank You, Lord, for standing in the gap to protect our marriage when Dennis and I had absolutely no idea what we were doing! Marriage is difficult. Two selfish, sinful people trying their best to love the other one better than him/herself - and failing often. The only reason we CAN love is because You loved us first, and best. Thank You for giving me and Dennis the desire to try, day after day, to love, respect, and serve one another. It is not easy, but it is worth it.